Case Presentation: During a routine cataract surgery, we called for a syringe filled with BSS to hydrate the wound at the end of the case. The syringe was topped with a standard reusable 27-gauge cannula that had been cleaned and sterilized according to our standard O.R. protocol. As the surgeon was about to hydrate the wound with the cannula he depressed the plunger of the syringe to remove any air bubbles and instead of clear BSS exiting the syringe, blue colored fluid came out [see video below]. Despite not having used the syringe yet in the eye, the anterior chamber was thoroughly irrigated with sterile BSS. Following otherwise uneventful surgery, the patient did well with a typical post operative course. However, this event seemed like a close call and could have very easily resulted in Toxic Anterior Segment Syndrome (TASS; described below). To help us understand the process and pitfalls involved in cleaning and quality control of our operating instruments, a chain of custody study was initiated to evaluate the sterilization process for reusable ophthalmic surgical instruments. Investigation revealed that the same cannula had been used to inject Trypan blue dye during cataract surgery three days prior. According to protocol, the cannula, along with all of the other instruments used that day, were cleaned, sterilized, and processed for reuse in subsequent cases. However, as is evident here, something about the system was not working in order for residual Trypan blue dye to remain in a cannula that had been properly processed. Since the cleaning and processing of surgical instruments is something of which most surgeons know very little, we sought to determine what exactly is involved in a day in the life of a Troutman cannula. Discussion: The Veteran's Administration Medical Center (VAMC) has numerous publications regarding the procedure involved in the handling of instruments (see references). There are essentially two phases to the process once the instruments reach the appropriate facility. These are decontamination and sterilization. 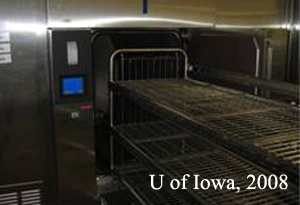 The decontamination portion of the facility is physically isolated from the sterilization portion but these are joined by large automated washing machines (Figure 1A) such that dirty instruments are loaded via doors in one side of the machine and removed via doors in the opposite end. Employees in the decontamination room must take appropriate precautions, wearing protective gowns, gloves, eye, and face shields in order to prevent exposure to potentially infectious materials. During decontamination, each instrument is visually inspected for residual foreign material (i.e. blood, tissue, etc) and cleaned by hand. Detergents and disinfectants are used as the instruments are scrubbed in large gross decontamination sinks (Figure 1B). Instruments such as cannulas are flushed by hand with cleaning solutions. After this, instruments are placed in an ultrasonic bath (Figure 1B), where ultrasonic energy in a heated water-detergent solution is used to remove residual microscopic particles. The ultrasonic bath works cavitation, in which microscopic bubbles are formed on the instruments and minute vacuum areas are created as the bubbles implode. This action draws out minute particles of debris from the instruments and is referred to as cavitation. After this, most instruments are placed in the large machine washers which interconnect the decontamination and sterilization rooms for further cleaning (Figures 1A and 1C). 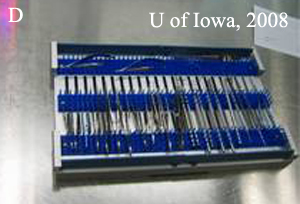 However, according to the VAMC training manual, special care must be taken with delicate microsurgical instruments as are used in ophthalmic surgery: "Once these delicate instruments are processed through the ultrasonic, rinsed, and dried, they should be processed on a sterilize cycle only to assure a decreased bioburden is achieved to allow safe assembly by the preparation room instrument technician." Thus the surgical instruments used in eye cases are subject to a less rigorous cleaning process that other more durable tools. Figure 1A: This large automated washing machine has two doors, one on the decontamination side of the facility and the other (shown here) on the "clean" side of the building. 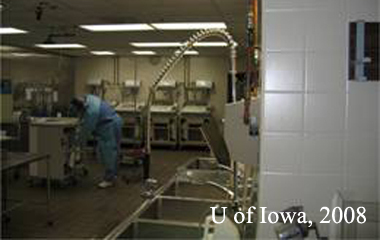 Figure 1B: The decontamination room shown here contains large wash basins (right side of image) where surgical instruments are cleaned by hand. At the rear of the facility are located the ultrasonic baths. Figure 1C: Another view of the decontamination room showing the large automated washing machines that connect to the clean side of the facility. Once on the other side of the washing machines, now in the sterilization room, the instruments are considered "clean" but not "sterile". 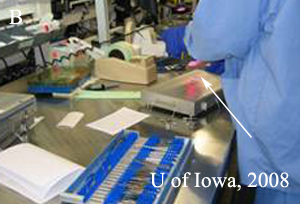 They are now hand sorted (Figure 2A) and arrayed in the appropriate position in their tray as per predetermined specifications which the technician accesses via a barcode embedded on each instrument tray (Figure 2B and 2C). 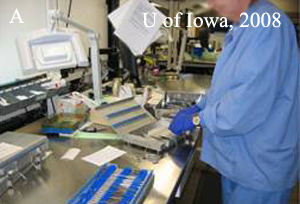 Figure 2: After leaving the washing machines, the instruments are hand sorted into the appropriate instrument tray (A). Each instrument tray has a barcode affixed which - when scanned into the computer system (B) - prints out a list of all of the instruments that belong in that particular tray and how they should be arranged (C). The finished product is shown in (D). 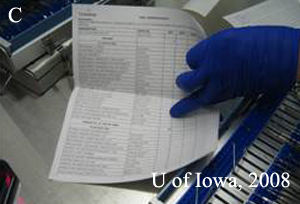 The completed tray is then wrapped in the familiar blue non-woven packaging material and sterilized (Figure 3A). Final sterilization occurs by one of two mechanisms - either steam or ethylene oxide (EtO). 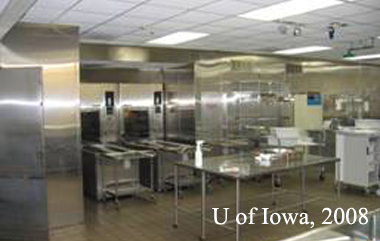 Steam sterilization uses high temperatures and pressures to kill any microorganism. This is accomplished in a large piece of machinery called an autoclave (Figure 3B), which is essentially a modified pressure-cooker. By the principle of the ideal gas law, higher pressure increases the boiling point of water to produce very high-temperature water. The higher the temperature, the less time is needed to ensure that all microorganisms have been eradicated. Ethylene oxide sterilization uses a toxic gas to alkalinize microorganisms and kill them. It is used for instruments that are moisture sensitive and thus cannot be steam sterilized. The gas can cause harmful side effects to those working with it and, if the instruments are not completely dry prior to EtO a potent hemolytic agent is formed which can have ill effects on the next patient. Figure 3A. 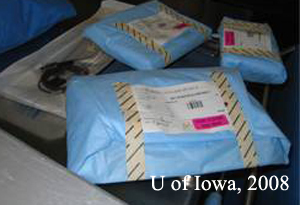 The instrument trays are wrapped in nonwoven packaging material and sterilized. They are then ready for use in the operating room again. Figure 3B. 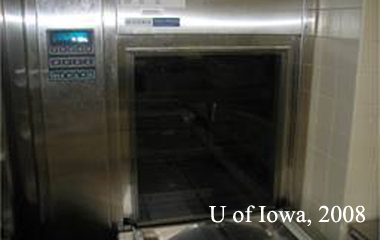 The final step in the processing of surgical instruments involves steam sterilizing using the autoclave shown below. This is basically a large, modified pressure cooker in which high temperature and high pressure are used to kill any microorganisms. At the VAMC it is estimated that the entire process as described here, including employee compensation costs several hundred dollars to process the eye instruments for each case. The total time involved is about 2 hours and a total of 4 staff members are involved. Despite this seemingly thorough protocol for cleaning and processing instruments at the VAMC, a 27-guage cannula retained Trypan blue dye. While the patient did well, the potential for ill effects including TASS from similar instances is real. TASS: Toxic Anterior Segment Syndrome (TASS) is a sterile inflammatory disorder that results from the introduction of a foreign substance into the eye. It can occur after any type of intraocular surgery but is most common in cataract surgery. It was first reported in reported in the 1980s as "sterile postoperative endophthalmitis" and was renamed TASS by Monson and colleagues in 1992. It usually occurs acutely following anterior segment surgery and is a sterile postoperative inflammation due to accidental introduction of a noninfectious substance into the AC that elicits toxic damage to tissues. The clinical features of TASS are similar to those of bacterial endophthalmitis and include blurred vision, pain, and redness. In TASS, the anterior chamber reaction is usually quite severe, resulting in hypopyon and fibrin formation. There is also generally limbus-to-limbus corneal edema due to widespread endothelial cell damage and a decreased in intraocular pressure often occurs. The hallmark features of TASS which help to differentiate it from infection are: A) Gram stain and culture are always negative, B) inflammation is always limited to the anterior chamber, and C) the condition always improves with steroids. TASS usually represents an endemic outbreak at a surgery center and can be due to a whole host of factors (see paper for figure). Some of these include retained ocular viscoelastic devices (OVDs) from prior surgery, medications with the wrong pH, detergent residues, and bacterial lipopolysaccharides or other endotoxins. The American Society for Cataract and Refractive Surgeons (ASCRS) formed a TASS Task Force in 2006 to investigate the increasing incidence of TASS in the United States. They found that 113 centers reported cases of TASS from 1/17/06-7/11/06. Despite extensive analysis of a multitude of potential contributing factors, the task force found no conclusive epidemiological evidence to implicate one product in the TASS cases. However, they did note that cleaning of ophthalmic instruments was suspect in many centers. The final outcome of the scrutiny was the formation of ASCRS-endorsed guidelines for cleaning and sterilization of instruments published in 2007. Mammalis N, Edelhauser HF, Dawson DG, Chew J, LeBoyer RM, Werner L. Toxic anterior segment syndrome. J Cataract Refract Surg 2006;32:324. Holland SP, Morck DW, Lee TL. Update on toxic anterior segment syndrome. Curr Opin Ophthalmol 2007;18:4. ASCRS Toxic anterior segment syndrome task force guidelines. Recommended practices for cleaning and sterilizing intraocular surgical instruments. Available at http://www.ascrs.org/TASS/upload/TASS_guidelines.pdf. ASCRS Toxic anterior segment syndrome outbreak final report. Available at http://www.ascrs.org/press_releases?Final-TASS-Report.cfm. Suggested citation format: Cohen AW, Oetting TA. Toxic Anterior Segment Syndrome (TASS): A System's Based View of a Day in the Life of a Canula. EyeRounds.org. May 7, 2008; Available from: http://www.EyeRounds.org/cases/85-Toxic-Anterior-Segment-Syndrome-TASS-Systems-Based.htm.